We are having a SALE!!! Beginning immediately and running until Friday, October 11 , 2013 at 9 AM (EST), all retail sales of King Tut and Lave Cones, Living Color and Razzle Dazzle spools are on sale at an additional 15% off their already discounted price. This means that you can stock up on thread and with a discount of 35% off the manufacturer’s suggested retail price! On top of that, ALL Books not published by Patsy Thompson Designs will also be on sale! These will also be discounted an additional 15% off their already discounted price. That’s 35% off MSRP! The Holidays will be here before you know it, so stock up on these threads and books for all of your Holiday projects! Enter the discount code: Two Weeks at checkout to get the discount! What’s new this week at the warehouse? Check out some of our wonderful new rulers and other great quilting notions below! These seam rippers are made of high grade steel & are thru hardened. They have a power-lock screw design; razor sharp edges; and superior rust & corrosion resistance. They will give you an easy, clean & precise cut every time. Grip n Rip set comes with a Comfort gel seam ripper and thimble. This is the thickest and the sturdiest freezer paper available. Extra thick sheets won’t curl and are reusable. Specially formulated coating for temporary adhering to fabric. Use with ink jet printer to print patterns, shapes and templates. Use as stencils, prevents bleeding. Have yourself a colorful little Christmas! From popular designer Linda Lum DeBono, this handmade-holiday collection offers an exciting array of decorating ideas. 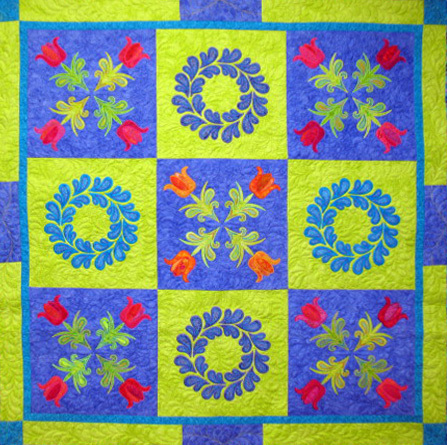 Celebrate the season with your choice of nine festive quilts in a wide variety of styles. Projects range from a bold “Holiday Cheer” table runner to a dazzling “Christmas Star Wreath.” And don’t miss the fast and fun “Little Forest” quilt, where the trees grow quickly. Learn easy techniques and get creative with fanciful fabrics. I love this particular brand of medicines! Buy cialis online! The difference between a brand name medication and a generic is in the name, shape and price. This strip-friendly design uses neutral blocks of varying sizes to stagger the strips, reminding us of the planks on a boardwalk. 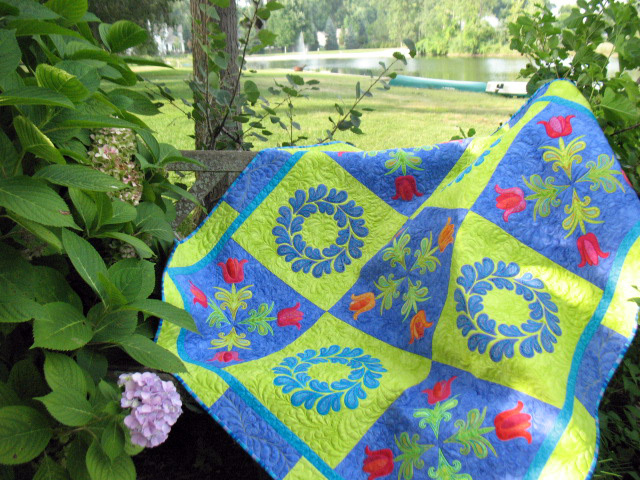 You can make this quilt using pre-cut strip packs or fashion fabrics that you select. The pattern includes instructions for two arrangements of the colored strips, and two finished sizes of quilt. This book has refreshing new samples, re-worked techniques and re-colored graphics. Many new design variations, two new patterns, templates for framing the circle quilts, the 10 degree wedge extension and the mini 10 degree template are included with this book. All templates are paper. Check out these four wonderful corresponding rulers to go with the 20th Anniversary book! They can be used with this book and so much more! The ten degree wedge is used to make the quilts in the book Quilts Without Corners. The tool includes reproducible circular graph paper and a complimentary tree skirt pattern. Extend the 10 degree wedge to make your designs a 70in square. The tool is marked to make squaring simple. Extend the 10 degree wedge to make your circles 70in in diameter. Create perfect pieced hexagons with 2in, 4in or 6in finished centers by squaring up each round of strips as you go. Since each round is squared up before the next set is added, the blocks created are perfect hexagons. Or use the markings to cut 2in to 8 in finished hexagons & every size in between. All NON-PTD Books are on sale! Please check out all of our: Books by Other Authors! LAVA is a #35 polyester thread precision-dyed with 1-inch color change intervals. 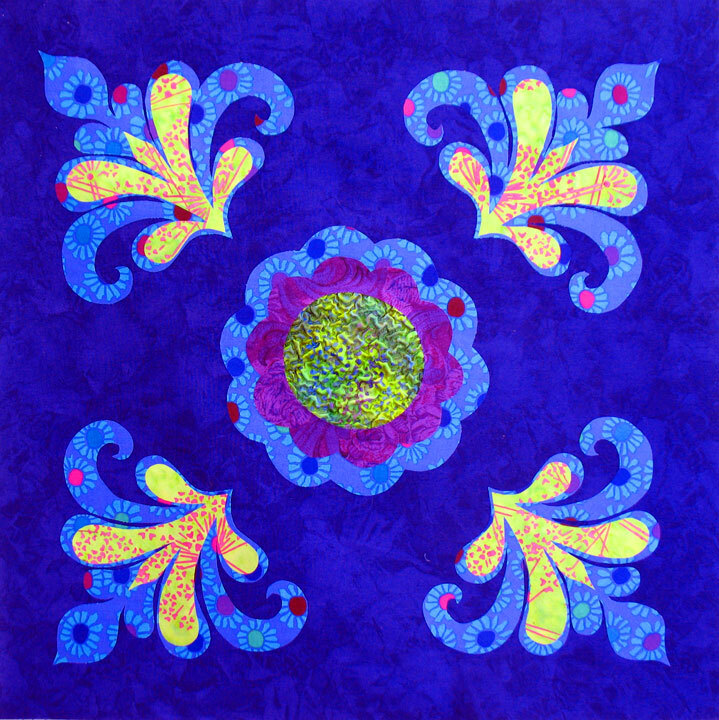 LAVA is wonderful for quilting, embroidery, and decorative appliqué. LAVA is is precision-dyed so there will be not be random selections of color but a uniform color change pattern. Living Colors by Hollis Chatelain is a 40 wt. high-sheen premium trilobal polyester thread. 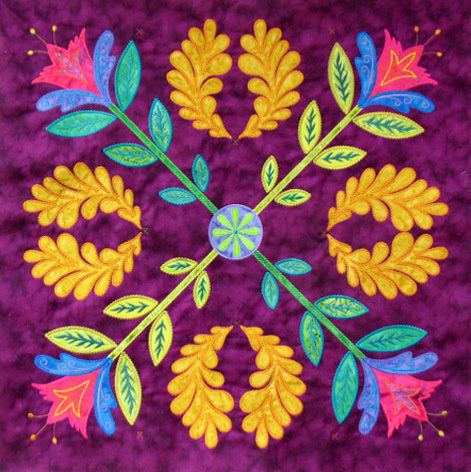 Beautiful color presence when embroidered or quilted. Excellent skin tones for thread painting portraits. Sheen is similar to rayon but Living Colors are stronger and colorfast. Razzling dazzling 8 wt. polyester thread for bobbin work, couching, reverse quilting, and serger. Beautiful sparkle makes Razzle Dazzle stand out in your projects. Beautiful accent thread for couching projects. Polyester thread intertwined with metallic. Razzle Dazzle is made from polyester with metallic and is iron safe up to 450 F degrees. Most irons up to the medium heat setting are within that range. 2. No matter how much I love to quilt, I have loads and loads and loads to learn about machine quilting. 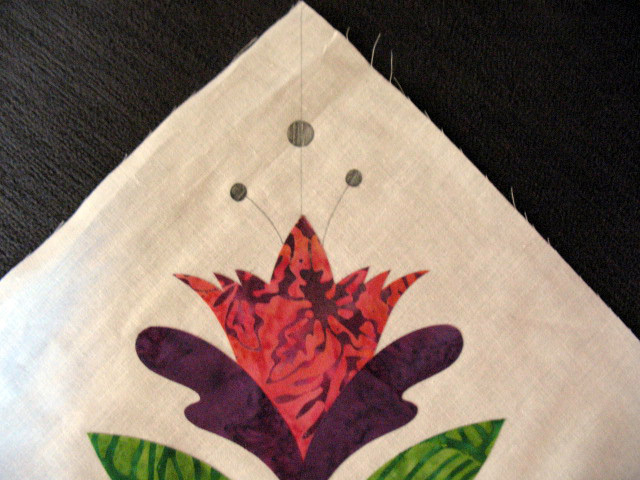 Truthfully, there are times that I find my quilting somewhat boring and I want to learn new skills. I have seen some of the most beautiful and most interesting quilting of my life in the past year and I find myself very drawn to machine quilting where the quilting itself divides the original surface design into a new secondary design. Right now, I do not possess the “vision” to do this well but I sure as heck want to learn how to do it. 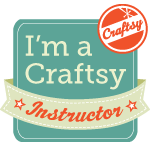 What better way than to learn from quilters who have mastered this? So, with that introduction, let me refer you to a blog post that has me VERY excited! 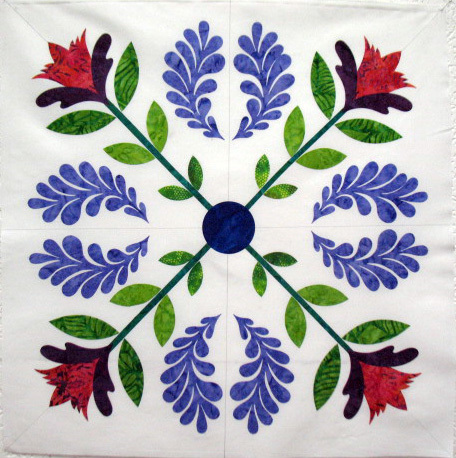 Margaret has posted some photos of how she transformed the Tick Tack Tulip Quilt shown above into a masterpiece, all by virtue of her expert quilting. If you look closely at her photos, you will see some wonderful examples of creating a new secondary design with her quilting. I can’t wait to see this baby in person because I will spend many hours scrutinizing it and hoping to learn just a smidgeon of this skill. Ironically, I have one other quilt that’s out to be quilted by another quilter extraordinaire, and I’ll post about that quilt and that long armer later on! For now, feast your eyes on Margaret’s blog and please scroll backward to look at her work…fabuloso! (Here’s a link to one of my favorites posts!) And if you’d like to learn how to make the Tick Tack Tulip Quilt and have this quilt hanging in your shop, ask your local quilt shop owner to give me a call! Everyone should use this product. If the gut isn’t working right than all the other products you take will not be able to do there job! Cheap levitra online us. The difference between a brand name medicine and a generic one is in the name, shape and in the price. Once I have those quadrants outlined, I have an idea of how large a space I want to fill. Since the point of intersection is the center of the block, anything I place there will be in the dead center. In this case, I wanted to place that large daisy in the center. My mom gave me a brightly painted wooden mirror in that shape when I was about 13 years old, and whenever I have gone back to visit her, I have seen that brightly colored mirror. My mom moved a few years ago and we needed to clean out her house, so I took that mirror home and traced its shape to get my center flower and the smaller flower inside it. The only thing I did to alter it was to texturize some fabric with Texture Magic and I used that to fill the center-most section. If you’ve never used Texture Magic, here is a link to a video we made about how to use it. So, back to designing this block…I plopped my center flower in that center position and this left “blank space” in the 4 diagonals that spring from the center. I took a ruler to measure the length of a quadrant, then I folded a piece of paper in half and placed 2 pencil marks on it that gave me a rough idea of a starting base point for my design and my upper ending point, or “tip” of my design. (I deliberately made the length of these marks less than the measured length of a quadrant since I didn’t want to overcrowd the block.) I drew one side of the light blue shapes above in pencil, then I cut them out along the folded side to ensure I had a design with symmetry. I placed my paper version in one corner to make sure it would fit, then used my paper template to trace around onto Wonder Under fusible web and then fused/cut my fabric applique pieces. I did that same thing for the smaller yellow shapes that you see inside the light blue shapes. I am mainly working with shapes cut from Appli-K-Kutz dies that were cut on my Sizzix Big Shot machine, so that makes this part of creating a “mock up block” fairly easy. BUT… this is only the beginning! Other times, it is a major overhaul. Can you spot the problem in the block photo below? It has become so easy to “play” with images that it’s a wonder we do anything else anymore. Until my next post, happy quilting! My husband used to start everyday with the product and it really works. Buy 25mg viagra? Our goal is to provide medications at discount rates to everyone who is affected by expensive local prices. Take a close look at the free motion foot. That is an improvised foot (aka a home-made foot) that I created by using the Babylock/Brother Free Motion Foot C and super-gluing a 1/4 inch high cylinder to the top of it. My hope is that all these sewing machine companies will start developing feet for us HDSM users to allow us to do this ruler work, but in the meantime, we have to get inventive. I held that ruler with my left hand as I moved the quilt with both my hands. Deliberately running the edge of your foot along the edge of the ruler will get you a nice, smooth, curved line. I should also tell you that the ruler I was using here is called the 6 1/2 inch Fine Line Continuous Curve Ruler and you can read about it here. If there is any part of you thinking about trying this, go for it! It is loads of fun and even though it’s a bit humbling because you’ll make a lot of errors, it really allows you to create some very interesting quilting designs. It’s harder to hold the larger rulers and for me, the 6 1/2 in curved ruler and the smallest size of the straight ruler are very easy to manage. Good luck! I have tried many brands of products and this is definitely the best I have used. Buy diflucan online? That is why we pay attention to the quality of the medications. To celebrate Labor Day, we are having a sale! All retail sales of Appli-K-Kutz dies, PTD books, PTD DVDs, and stencils are 25% off through this Friday, 9/6/13 at 9 am eastern DST. To get the discount, enter Labor Day 2013 in the discount code box during checkout! To keep my erection healthy this are the ticket. Canada cialis generic. We offer Canadian medications from a fully licensed Canadian mail order pharmacy.